This is the STORK restaurant recently opened in Amsterdam, Netherlands. The loft design has been built in an old factory of 12.000 feet, which has become the biggest sea-food restaurant in Europe. The restaurant has an original feature, it has been decorated with DIY furniture from recycled materials, including pallets furniture. The sofa that divides the center of the room is made fully with recycled wooden pallets, and many of the tables are made from recycled wooden coils. 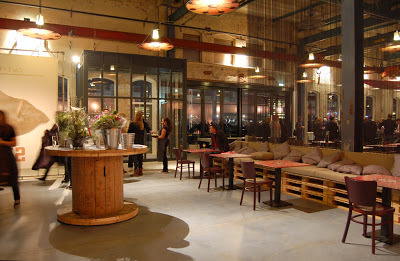 The use of the pallets and coils for the furniture gives it an industrial decoration for the restaurant. It is a decor and design that is constantly present in the space of the loft, with the use of mass production materials, huge spaces and steel structures. Do you like this DIY pallet decoration? Do you want to look for other DIY pallet furniture?